Everybody loves lots of windows in their house. Windows provide you with a view to the world. They provide natural light, warmth when the sun is shining, fresh air when the weather permits and the ability to cool your home on those hot summer nights. Everyone loves lots of windows except for a survivalist or prepper. Unfortunately windows can also be an invitation for uninvited guests during times of trouble. Providing a weak spot for entry into your home or business. To break into someone’s house through a window you have to be committed to the crime. A window is loud, broken glass is dangerous, and climbing through a window is not easy. But compared to kicking down a door or picking a lock, breaking a window is a quick way for entry. Also, many doors now days have an alarm systems tied to when the door opens and closes. But those same alarm systems rarely recognize when a window is broken or when a window is opened. – 2,000,000 home burglaries are reported each year in the US. – About 30% of all burglaries are through an open or unlocked window or door. – Nearly 66% of all burglaries are residential (home) break-ins. – Renters are just as likely to be the victims of property crime as homeowners. – The highest % of burglaries occur during the summer months. – Homes without a security systems are up to 300% more likely to be broken into. – 1 out of 3 residential assaults are a result of a burglary. – 85% are from amateurs who are usually more desperate and dangerous. – 95% of break-ins needed some amount of force to break-in. – Thieves prefer easy access, through an unlocked doors or windows. Let’s face it, we have all been to the bad side of town and seen bars on the windows. Right when you start to notice the bars on the windows, your situational awareness alert starts to go off and you posture begins to change. You often see bars on the windows in bigger cities in almost all of the neighborhoods, not just bad ones. Personally, bars on the windows do not bother me. The more security, the better in my mind. But bars on the windows can also give off the wrong message in a nicer neighborhood and can be a trap if you have a house fire. I have been through nicer neighborhoods and seen bars on the windows and thought to myself, that person either is keeping something of value in their home or they are very paranoid. I have never personally priced out window bars but I imagine that they are not cheap. Also, the installation has to be somewhat invasive because you have to anchor the bars to the house with bolts or heavy screws. In an emergency, your access to get out of that window will be limited but your piece of mind will be high because you know that getting through bars will be very difficult for an intruder. An alternative to window bars are security shutters. The advantages of shutters over bars is that when they are opened, you have full use of your window and could actually get out of that window in an emergency. Another advantage is that the shutters actually provide extra insulation for both weather and sound. 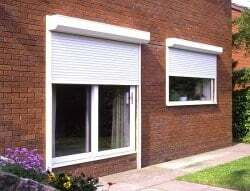 The disadvantage of shutters is that when they are closed, you cannot see out of them. I actually have some experience with these. When I lived in a major city on the west coast, I actually had one of these installed on a ground floor window of a townhouse that I owned. I came home one night and found a homeless person sleeping next to my front door under that window and I thought to myself, I need to do something about that window or someone will be breaking into my house. The security window shutter worked great but it was expensive and looked a little bulky on the outside of the house. Also, I had to remember to shut it all of the time at night and open it for fresh air during the day when I was home. I know there are some models now that work on timers with RF controllers but I had the kind that you had to manually roll up and down like a window shade. So it was a little painful to say the least. We have all seen the photos of Hurricane Katrina (and other hurricanes for that matter), where people board up windows with plywood and boards. Yes, this is an alternative during a major disaster but the reality is that it is not very practical for everyday living. Not to mention that boarded up windows are against most local ordinances unless the house is vacant. So while it might not be a bad idea to keep some sheets of plywood on hand for a major disaster, your neighbors are not going to be real happy when you board up your windows on a nice sunny day. Recently my neighbor had a bad experience. One night while he and his wife were at home. A person walked up to their home and tried to open their storm door which was locked. The perpetrator then tried to kick in the glass of the storm door which unbelievably held up to his boot. By the 3rd kick, the perp was staring down the barrel of a 12 gauge shotgun being held by my neighbor and decided to leave the area. After the traumatic event, my neighbor decided to upgrade his home’s security by adding motion lights, a security system, cameras, and security film to his windows. I have known about 3m window security film for some time but never investigated it fully until my neighbor put it on his house. Before the event at my neighbors house, we had already decided to move to a new town. The new house we moved into has a lot of windows and a high homeless population in the area. On top of the homeless population, our new town has a high arrest rate for both heroin and meth. Having bars or security shutters put on my new house was a little bit out of the question for cost reasons and appearances. I didn’t want to be the only house in my neighborhood with bars on the windows but on the flip side, I wanted to have protection against a possible break in. 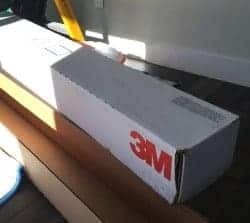 I called a local window tinting company, who was a 3m dealer, and asked them about the cost and the installation of the 3m Ultra Series Safety & Security Window Film. Surprisingly, it was not that bad. For about 33 windows & sliding glass doors on the main floor of my house, the cost was under $2,000 installed. That to me was a good price for piece of mind. Now, will the film keep someone out who really wants to get in? No, but it will give me precious time to bring my friends Mr. Shotgun and Mr. Glock to the party. 3m offers 3 different levels of protection for window film and a bonding system the bonds the film to your window frame for added protection. From the company’s website here is the description of all three film layers and the bonding product. I ended up going with just the mid-level protection (Ultra Series) and did not do the impact protection system. I believe the impact protection system may be better suited for a commercial type property or vacation home that will be unoccupied at night, where no matter what, you want to keep someone out because the police response time may be long. 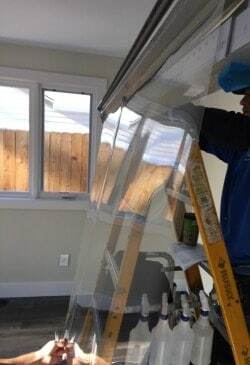 You can also get a tint to the window film but that tint might make your windows a little hazy. I went with the totally clear window film to make my windows look as normal as possible. 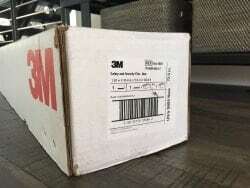 Make sure you have this discussion with your 3m dealer before the install about tinting or no tinting. The installation took about one day with two installers. First, they meticulously cleaned the windows, then they applied the window film. After the window film was applied, they worked to remove all bubbles to make sure the windows looked totally clear. After the installation, they said that I might see a few bubbles in the windows but they should evaporate and disappear within 3 to 4 weeks. If any bubbles stay longer than two months, they would come back to fix the film. Out of 33 window/door treatments, I only noticed about 3 bubbles but after a few weeks they disappeared as promised. 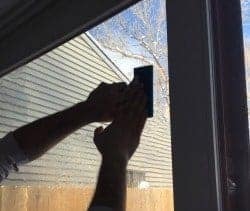 My wife can no longer tell the difference between the treated and untreated windows, which is good. So far I can report that I have not had my windows tested by someone trying to break in and probably never will. However, I do sleep easier at night knowing that I have an upgraded level of protection on the ground floor of my house with the 3m Window Security Film. Is the product worth the cost? Ask me that question after someone tries to break into my house through one of my windows.